Nuki - Smart Lock. Turn your smartphone into a smart key! Turn your smartphone into a smart key! Do you already know how Nuki works? With Auto Unlock your door opens automatically when you come home. Your smartphone remains in your pocket. With Nuki you have full control over your door lock wherever you are. You can control the current status of your door lock - anytime and from anywhere. So you never have to ask yourself if your home is locked safely. If you want, Nuki can lock and unlock your door at defined times.You never have to worry again if your home is unlocked over night. With the Lock ‘n’ Go function, Nuki locks your door automatically after you have left your apartment or your house. Have you ever asked yourself how much time you spend with searching for keys? Through Nuki searching keys has come to an end and you have time for the important things in live! How do you want to use Nuki? I want to buy Nuki for me or my family. I want to use Nuki for work / my office. I have children and want to know if they have arrived home safely. Do you ask yourself daily if your children have arrived home safely? Due to Nuki your children don’t need a key anymore which they could lose. They either use their own smartphone or the Nuki Fob. In case that the Fob gets lost, the locking permission can be revoked within a few seconds. If desired, parents can receive notifications or look into the activity log anytime to see if their children have arrived home safely. Due to Nuki I always know when my kids are back home safe. I also want to use Nuki without a smartphone. With the small Bluetooth key fob you can lock and unlock your door even without your smartphone at any time. With this device also people without a smartphone can get access to your home. Especially for kids, seniors and service providers the Nuki Fob is the perfect solution. Also sportsmen appreciate the convenience because the Nuki Fob fits easily into every small pocket. The Nuki Fob is shockproof and waterproof and will convince you with its stability as well its battery life of more than 10 years. One Nuki Fob can be authorised for up to 100 Smart Locks. Due to the Nuki Fob I can give access to my cleaning worker without handing over a key. In this way, I always have control when she can or cannot enter my apartment. I am a passionate sportsman and like being in the nature. Do you want to leave your keys at home while doing sports? Every sportsman knows the question: Where should I put my key? Either it jingles with every movement or an appropriate pocket for the key is totally missing in the sports outfit, whereas the smartphone is put into a dedicated pocket. Why don’t you leave your key at home in future? With Nuki you never have to worry again that an employee loses the key or the office is unlocked over night. Due to the activity log you can check the status of your door at any time and react from afar. With Nuki you can check if your office is locked from anywhere, at any time. You have full control and decide who is allowed to enter the office. Due to automatic locking times your office won’t be unlocked again over night. In addition, you can check who and when was in the office - the activity log can be only checked by someone with administration rights and can also be deactivated if desired. Nuki is as flexible as your company. Use your time for more important things in everyday business and don’t waste thoughts anymore on your convenient, physical key. One door and many keys - a matter of costs? It doesn’t matter if it is an association building, a community room or an Airbnb apartment - the Smart Lock is an easy and cost-effective solution to give access to all members, guests or employees. And if you are not there, you keep the overview with the activity log at any time. You have better things to do than letting keys being reproduced or handing them over manually. With Nuki Web you have access from your computer to all features you already know from the Nuki App. In the activity log you can see immediatly who and when entered or left which property. This creates safety and gives you better control of your service providers. Due to the clear user management you can see with Nuki Web at any time who has access permissions to which properties and manage them from anywhere. Nuki Web gives you a fast and comfortable overview of all Smart Locks of your properties. Nuki should facilitate my life with my Airbnb or holiday apartment. Do you have a holiday apartment which you share or rent out? Handing over the keys is one of the most laborious matters with holiday or Airbnb apartments. With Nuki this problem is history: with digital access permissions you decide from afar who, when and how long people get access to your property. You can also give access to your holiday apartment to cleaning workers or craftsmen, for example, for a limited time period which you can manage and control from afar. *The prerequisite is a lock cylinder with emergency function (you can still lock your door even when a key is inserted on the inside). When you activate the Auto Unlock function, Nuki unlocks your door automatically when you come home. Your smartphone remains in your pocket. Nuki uses the location of your smartphone to detect when you leave your home. If you approach your home again, the Nuki app is preparing to open your door. When you reach your door, Nuki unlocks it automatically via Bluetooth. The next Auto Unlock will only be triggered when you move away from your home for more than 100 metres and enter again. So unwanted locking operations are avoided. Nuki offers unique benefits compared to other producers and the conventional key. Nuki installation - it doesn’t get any easier! The Nuki Smart Lock can be installed on the existing lock cylinder within a few minutes. Depending on the overhang of your cylinder, you either choose the supplied clamp plate (mounting plate A) or the sticky pad (mounting plate B). See how easily Nuki is installed. The installation is super easy and done without causing any damages to the door. It was installed within 4 minutes and it works as it should! Both mounting plates can be removed without any residues in case of need. Therefore Nuki is the optimal solution for rental properties and you don’t need the approval of your landlord. Your door remains undamaged and Nuki can be removed without any residues in case of need. How does your door pull look on the outside? Nuki can be mounted on doors with a door handle. Nuki can be mounted on doors with a knob on the outside. Nuki can pull the latch and hold it for 2 seconds. Nuki can be mounted on doors with a pole on the outside. Nuki can pull the latch and hold it for 2 seconds. Nuki is installed on top of your key on the inside of your door. Nuki just turns the key, therefore your insurance coverage won’t be affected. In the initial calibration process Nuki recognizes how many times the key has to be turned. It doesn’t matter if you need rotations of 360°, 720° or more to lock the door. Nuki was developed in Austria and is produced in Switzerland. Our Smart Lock is compatible with Euro Profile Double Cylinders and Swiss Round Profile Cylinders. As long as you don’t have to be a bodybuilder to turn your key, Nuki won’t have any problems to open your door. In general, the batteries last longer if your lock is running smoothly. If you can lock your door from the outside while a key is inserted on the inside you have a key cylinder with emergency function (also known as external key override function). You need this function to be able to still lock with your physical key from outside while Nuki is installed on the inside of your door. Does Nuki fit on my door? No worries - in our installation check you find out if your door is compatible with Nuki. You can also write us - we will be glad to help you. For how many doors do you want to use Nuki? Nuki is ideal for your home. Each door you want to lock with Nuki, you need a Smart Lock. The range of the Bridge is around 5 metres. Depending on the distance between the doors you need at least one Bridge to have access from afar. If you want to buy Nuki on a large scale get in touch with our sales team! You are not sure if Nuki fits your door? 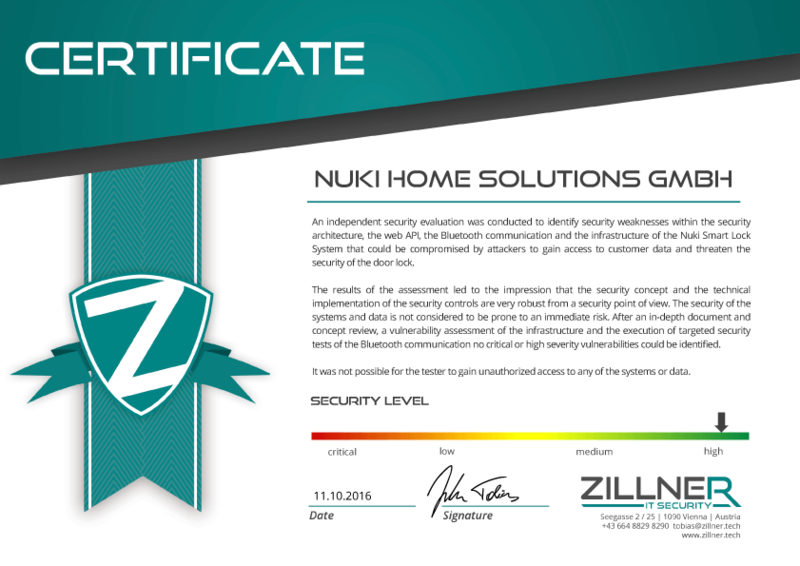 In the installation check you find out if Nuki is compatible with your door by answering a few simple questions. Just go to your door and answer the questions. You are currently too busy to do the installation check or you are not close to your door? No problem - we will gladly send you a reminder with the link to the installation check via mail. The communication of the Smart Lock is End-To-End encrypted. The same security standards are used in online banking and were proven by independent safety experts. With these safety precautions it is not possible for third parties or the company Nuki to get access to your Nuki Smart Lock. How do I open the door if the Nuki batteries are empty? The batteries of the Smart Lock should last around 6 months (calculated with 8 locking operations / day). When the battery voltage is under 20%, you will receive a notification from the Nuki App and you have enough time to change the batteries. Can I also open the door with my conventional key? If you can lock your door from the outside when a key is inserted on the inside you have a key cylinder with emergency function (also known as external key override function). You need this function to still be able to lock your door with your physical key even when Nuki is installed on the inside. The Nuki Smart Lock can be retrofitted on every door with Euro Profile Double Cylinder or Swiss Round Profile Cylinder. You can find out more about that in our installation check. How safe is Nuki from hackers? The communication of the Smart Lock is End-To-End encrypted. The same security standards are used in online banking and were proven by independent safety experts. How do I open the door when my smartphone battery is empty? We recommend to use a key cylinder with emergency function with the Nuki Smart Lock. With this function you can also unlock your door with a conventional key from the outside if need be, even when the Nuki Smart Lock is installed. Moreover, the Smart Lock can be unlocked with the Nuki Fob or another smartphone with locking permission. Alternatively, you can also log-in on your Nuki Web interface via any web-connected device to lock and unlock your door. Is Nuki compatible with HomeKit? The HomeKit support is one of the most common inquiries we get. As customer requests have top priority for us, we are glad to announce that we are already working actively on a HomeKit integration. I want to integrate Nuki in other smart home systems. You have already set up your Smart Home and want to integrate Nuki in your existing system? No problem! Nuki is already compatible with many systems and will further improve its compatibility in the future. To achieve this goal, we are constantly working on implementations of other integrations of our Smart Lock. A combination you will love. Extend your Smart Lock with the Nuki Bridge and control your Smart Lock also from a distance. Anytime, from anywhere. Save € 29,- if you buy a Nuki Smart Lock + Nuki Bridge with our perfect combination deal. You have reached the end of the page! You still have unanswered questions? Get in touch with us via e-mail.